Ronald reveals in this stranger-than-fiction-tale how Hildebrand Gurlitt succeeded in looting in the name of the Third Reich, duping the Monuments Men and the Nazis alike. As an "official dealer" for Hitler and Goebbels, Hildebrand Gurlitt became one of the Third Reich's most prolific art looters. 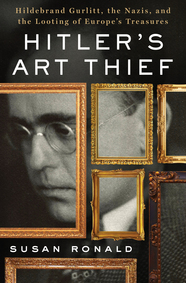 Yet he stole from Hitler too, allegedly to save modern art. This is the untold story of Hildebrand Gurlitt, who stole more than art-he stole lives, too. Born and raised in the United States, Susan Ronald has lived in England for more than twenty-five years. She has consulted for five British government departments and The National Trust as an historian and commercial advisor on Britain's historic built environment. As the keynote speaker at the Richard III Society's Annual General meeting in 2011, she put into context the Tudor world view of Richard III as expressed in Shakespeare. She is the author of six history books ranging across the ages, with this latest book being her first foray into the twentieth century. She is also the author of Heretic Queen: Queen Elizabeth I and the Wars of Religion, Shakespeare's Daughter (a novel), The Pirate Queen, The Sancy Blood Diamond, and France: Crossroads of Europe. She also owns a film production company, and is a screenwriter and film producer.